Strong tremors travelled and felt in Kabul, Lahore, and Delhi as per the news from BBC. The residents in those areas were forced to leave their houses and go in open areas. Even the metro train service was halted temporarily for about 2 minutes in New Delhi. The earthquake of Sunday, yesterday, originated from the same venue as the 7.5 magnitude quake occurred and took over 300 lives in October 2015. It was also felt in China (in regions of Kashgar, Hotan, and Kizilsu Kirgiz). Earlier, there were no reports of any loss of life or significant damages or injuries. 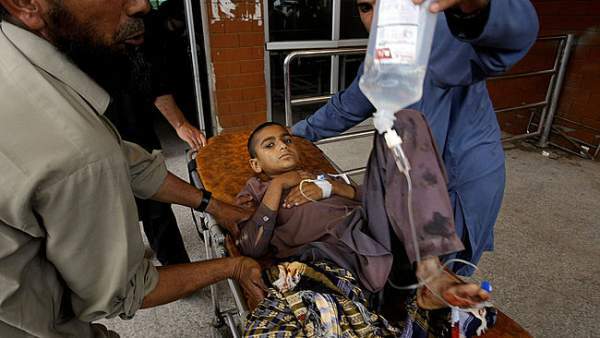 Later on, news came that at least 27 people were admitted to hospital in Peshawar, Pakistan. AccuWeather Meteorologist Adam Douty stated that unsettled weather around the epicenter can restrict the cleanup and recovery efforts. “Low pressure will continue to bring scattered showers and thunderstorms across northern Afghanistan and Pakistan on Monday and Tuesday,” Douty said. “Rain should become more isolated around the middle of the week, but an isolated thunderstorms still cannot be ruled out over the mountains of northern Afghanistan,” Douty said. Douty gave a piece of advice. It is that as soon as someone hears thunder, they all should get under some shelter as the danger of getting struck by lightning is present. Update: The death toll has raised to six in Pakistan – two people died in Buner and Swat areas of KP province, while one died in Diamer area of Gilgit-Baltistan region. More than 28 people have been injured. The entire area in North India including Kashmir, Leh, Haryana, Rajasthan, Punjab, Uttarakhand, Himachal Pradesh have been shaken. Tremors were felt in regions of Gujarat and Madhya Pradesh too at 3:59 pm. In Gujarat, Surat and Tapi district were affected by a low 3.4 magnitude earthquake today at 3:04 pm as per the reports of Institute of Seismological Research (ISR). In Kashmir, 6.8 earthquake felt at 3:59 pm. No immediate loss reported.